We’d love your help. Let us know what’s wrong with this preview of All the Things You Are by David Evanier. The first complete biography of singing legend Tony BennettAmong America's greatest entertainers such as Frank Sinatra, Judy Garland, Ray Charles, and Sammy Davis Jr., Tony Bennett alone is still here and at the top of his game. For the first time, All the Things You Are tells the incredible story of Bennett's life and sixty-year career, from his impoverished New York City The first complete biography of singing legend Tony BennettAmong America's greatest entertainers such as Frank Sinatra, Judy Garland, Ray Charles, and Sammy Davis Jr., Tony Bennett alone is still here and at the top of his game. For the first time, All the Things You Are tells the incredible story of Bennett's life and sixty-year career, from his impoverished New York City childhood through his first chart-topping hits, from liberating a concentration camp to his civil rights struggles, from his devastating personal and career battles and addiction in the 1970's to his stunning comeback and emergence as a musical statesman, America's troubadour, role model and mentor, and unmatched interpreter of the American songbook. To ask other readers questions about All the Things You Are, please sign up. If traditional pop singers are ever given their own Mount Rushmore, Antonio Benedetto belongs on that monument. Tony Bennett has earned a spot on that rocky hillside for at least three good reasons: his commitment to protecting and preserving the best of America’s songbook, his incredible volume of recorded work and his unbelievable longevity, more than six decades of artistry. In this volume, David Evanier celebrates all of that, all the things that are Tony Bennett. A fourth reason Bennett dese If traditional pop singers are ever given their own Mount Rushmore, Antonio Benedetto belongs on that monument. Tony Bennett has earned a spot on that rocky hillside for at least three good reasons: his commitment to protecting and preserving the best of America’s songbook, his incredible volume of recorded work and his unbelievable longevity, more than six decades of artistry. In this volume, David Evanier celebrates all of that, all the things that are Tony Bennett. A fourth reason Bennett deserves to be immortalized in stone might be the fact that while pushing 86 years, (long past the time when other iconic entertainment legends have lost their musical gift), he seems to improve with age. Early in my own radio career, I played many of Bennett’s hits on the air in the sixties, but, to me, he was just another voice along side Sinatra and so many others in those post Beatles-days. Having read Evanier’s profile, I now know the man behind the voice. If Bennett remains a mystery to you, I highly recommend you dig out the two You Tube videos featuring his duo with K D Lang dusting off Bennett’s 1950 hit, “Because of You.” In my mind, his two duet projects are as good as it gets. In spite of those shortcomings, Evanier has inspired me to get to know Bennett the painter and to explore his two published books visually documenting what his heart has seen. Listed among America’s greatest entertainers, Tony Bennett is still here and at the top of his game. The story of Mr. Bennett’s sixty year career from an impoverished childhood to liberating a concentration camp, his civil rights struggles, and his personal battles ranging from addiction to career struggles and marriage problems is a fascinating read. Many artists and personalities are encountered in the book, and his deep respect for his friend and idol, Frank Sinatra is made abundantly clear. The author’s insight into his devotion to his art and to humanity draws a personal and glowing picture of a caring man who is a perfectionist in his music and his art. A very good read about the world of entertainment and music. Very sloppily written book. The author makes revelations about Tony's life and 10-20 pages later repeats the same incident as if you had never read it before. Editing is bad too. A good editor would have caught that. While I'm a Bennett fan, I couldn't get past the bad writing. The author apparently had no feedback from Tony so why am I reading a book that simply quotes other books and articles? Couldn't finish it. Poorly organized and repetitive. It sometimes reads as though the author found a stray note card and squeezed the info in right where he was regardless of it's relation to the topic at hand. Still, lots of fresh info here, and some interesting dissenting views regarding his latest career. I got the impression that the author did not interview Bennett for this book, and was using quotes from other books about him. I couldn't even finish it, it was so dull. So-so biography based on secondary sources only. 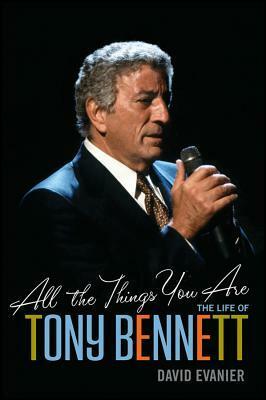 I like Tony Bennett but I didn't really get to know him more better after reading this book.